Mackay & al. against Murray & al. The joint Answers of John Murray and others, to the Appeal of James Mackay and others, was brought in. 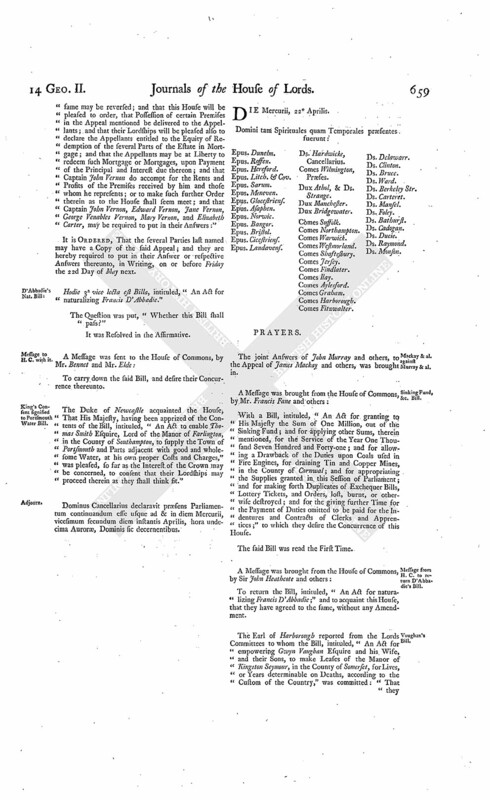 With a Bill, intituled, "An Act for granting to His Majesty the Sum of One Million, out of the Sinking Fund; and for applying other Sums, therein mentioned, for the Service of the Year One Thousand Seven Hundred and Forty-one; and for allowing a Drawback of the Duties upon Coals used in Fire Engines, for draining Tin and Copper Mines, in the County of Cornwal; and for appropriating the Supplies granted in this Session of Parliament; and for making forth Duplicates of Exchequer Bills, Lottery Tickets, and Orders, lost, burnt, or otherwise destroyed; and for the giving further Time for the Payment of Duties omitted to be paid for the Indentures and Contracts of Clerks and Apprentices;" to which they desire the Concurrence of this House. Message from H. C. to return D'Abbadie's Bill. To return the Bill, intituled, "An Act for naturalizing Francis D'Abbadie;" and to acquaint this House, that they have agreed to the same, without any Amendment. The Earl of Harborough reported from the Lords Committees to whom the Bill, intituled, "An Act for empowering Gwyn Vaughan Esquire and his Wife, and their Sons, to make Leases of the Manor of Kingston Seymour, in the County of Somerset, for Lives, or Years determinable on Deaths, according to the Custom of the Country," was committed: "That they had considered the said Bill, and examined the Allegations thereof, which they found to be true; that the Parties concerned had given their Consents; and that the Committee had gone through the Bill, and made some Amendments thereunto." Hodie 2a vice lecta est Billa, intituled, "An Act for the more effectual Conviction of Offenders, transported, unlawfully returning to Great Britain or Ireland; and for the further Punishment of Persons enabling Prisoners to break Prison; and for empowering Justices of the Peace, in a Liberty or Corporation, to commit Offenders to the House of Correction belonging to the County, Riding, or Division, in which such Liberty or Corporation is situated; and for further amending an Act, made in the Thirteenth Year of His Majesty's Reign, relating to the conveying Vagrants." Ordered, That the said Bill be committed to a Committee of the whole House, To-morrow; and that the Judges do then attend. Upon reading the Petition of Robert Mercer Gentleman; setting forth, "That, pursuant to the Order of this House on Friday last, he has amended his Appeal, by making John Butler Esquire, Son and Heir of Thomas Butler Esquire, deceased, a Party thereto;" and praying, "That he, and also John Butler Esquire, One of the Executors of the said Thomas Butler, may be required to answer the same:"
It is Ordered, That the said John Butler the Son and Heir, and John Butler the Executor, of the said Thomas Butler, may have a Copy of the said amended Appeal; and do put in their Answer or respective Answers thereunto, in Writing, on or before Wednesday the 27th Day of May next; and that Service of this Order upon the Six Clerk of the said Thomas Butler be deemed good Service. Dominus Cancellarius declaravit præsens Parliamentum continuandum esse usque ad & in diem Jovis, vicesimum tertium diem instantis Aprilis, hora undecima Auroræ, Dominis sic decernentibus. Hodie 2a vice lecta est Billa, intituled, "An Act for granting to His Majesty the Sum of One Million, out of the Sinking Fund; and for applying other Sums, therein mentioned, for the Service of the Year One Thousand Seven Hundred and Forty-one; and for allowing a Drawback of the Duties upon Coals used in Fire Engines for draining Tin and Copper Mines, in the County of Cornwal; and for appropriating the Supplies granted in this Session of Parliament; and for making forth Duplicates of Exchequer Bills, Lottery Tickets, and Orders, lost, burnt, or otherwise destroyed; and for the giving further Time for the Payment of Duties omitted to be paid for the Indentures and Contracts of Clerks and Apprentices." Hodie 3a vice lecta est Billa, intituled, "An Act for empowering Gwyn Vaughan Esquire and his Wife, and their Sons, to make Leases of the Manor of Kingston Seymour, in the County of Somerset, for Lives, or Years determinable on Deaths, according to the Custom of the Country." The House (according to Order) was adjourned during Pleasure, and put into a Committee upon the Bill, intituled, "An Act for the more effectual Conviction of Offenders, transported, unlawfully returning to Great Britain or Ireland; and for the further Punishment of Persons enabling Prisoners to break Prison; and for empowering Justices of the Peace, in a Liberty or Corporation, to commit Offenders to the House of Correction belonging to the County, Riding, or Division, in which such Liberty or Corporation is situated; and for further amending an Act, made in the Thirteenth Year of His Majesty's Reign, relating to the conveying Vagrants." Ordered, That the House be again put into a Committee thereupon, on this Day Fortnight. Dominus Cancellarius declaravit præsens Parliamentum continuandum esse usque ad & in diem Veneris, vicesimum quartum diem instantis Aprilis, hora undecima Auroræ, Dominis sic decernentibus. E. Waldegrave takes his Seat. James Earl Waldegrave sat first in Parliament, after the Death of his Father James Earl Waldegrave; his Lordship having, at the Table, first taken the Oaths, and made and subscribed the Declaration, and also taken and subscribed the Oath of Abjuration, pursuant to the Statutes. Message from H. C. to return Vaughan's Bill. To return the Bill, intituled, "An Act for empowering Gwyn Vaughan Esquire and his Wife, and their Sons, to make Leases of the Manor of Kingston Seymour, in the County of Somerset, for Lives, or Years determinable on Deaths, according to the Custom of the Country;" and to acquaint this House, that they have agreed to their Lordships Amendments made thereto. Vernon to have Liberty to apply to pass Publication. 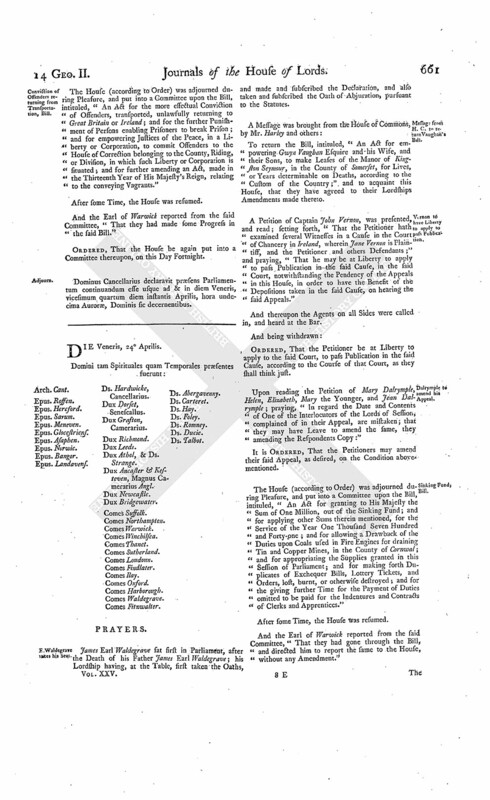 A Petition of Captain John Vernon, was presented, and read; setting forth, "That the Petitioner hath examined several Witnesses in a Cause in the Court of Chancery in Ireland, wherein Jane Vernon is Plaintiff, and the Petitioner and others Defendants;" and praying, "That he may be at Liberty to apply to pass Publication in the said Cause, in the said Court, notwithstanding the Pendency of the Appeals in this House, in order to have the Benefit of the Depositions taken in the said Cause, on hearing the said Appeals." And thereupon the Agents on all Sides were called in, and heard at the Bar. Ordered, That the Petitioner be at Liberty to apply to the said Court, to pass Publication in the said Cause, according to the Course of that Court, as they shall think just. Dalrymple to amend his Appeal. 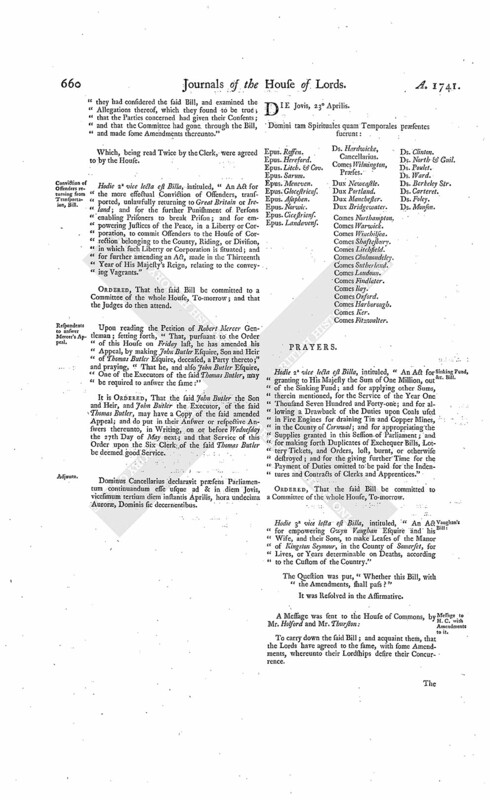 Upon reading the Petition of Mary Dalrymple, Helen, Elizabeth, Mary the Younger, and Jean Dalrymple; praying, "In regard the Date and Contents of One of the Interlocutors of the Lords of Session, complained of in their Appeal, are mistaken; that they may have Leave to amend the same, they amending the Respondents Copy:"
It is Ordered, That the Petitioners may amend their said Appeal, as desired, on the Condition abovementioned. 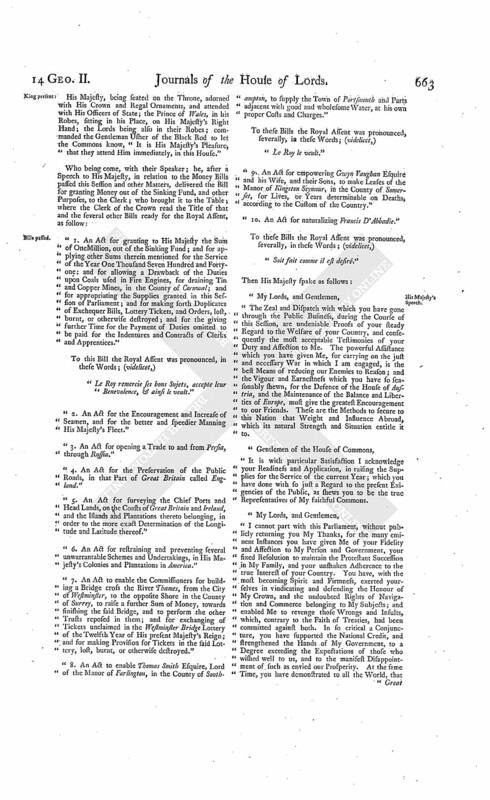 The House (according to Order) was adjourned during Pleasure, and put into a Committee upon the Bill, intituled, "An Act for granting to His Majesty the Sum of One Million, out of the Sinking Fund; and for applying other Sums therein mentioned, for the Service of the Year One Thousand Seven Hundred and Forty-one; and for allowing a Drawback of the Duties upon Coals used in Fire Engines for draining Tin and Copper Mines, in the County of Cornwal; and for appropriating the Supplies granted in this Session of Parliament; and for making forth Duplicates of Exchequer Bills, Lottery Tickets, and Orders, lost, burnt, or otherwise destroyed; and for the giving further Time for the Payment of Duties omitted to be paid for the Indentures and Contracts of Clerks and Apprentices." The Earl of Harborough reported from the Lords Committees to whom the Bill, intituled, "An Act to enable Thomas Smith Esquire, Lord of the Manor of Farlington, in the County of Southampton, to supply the Town of Portsmouth and Parts adjacent with good and wholesome Water, at his own proper Costs and Charges," was committed: "That they had considered the said Bill, and examined the Allegations thereof, which they found to be true; and that the Committee had gone through the Bill, and made several Amendments thereunto." Dominus Cancellarius declaravit præsens Parliamentum continuandum esse usque ad & in diem Sabbati, vicesimum quintum diem instantis Aprilis, hora undecima Auroræ, Dominis sic decernentibus. Hodie 3a vice lecta est Billa, intituled, "An Act for granting to His Majesty the Sum of One Million, out of the Sinking Fund; and for applying other Sums therein mentioned, for the Service of the Year One Thousand Seven Hundred and Forty-one; and for allowing a Drawback of the Duties upon Coals used in Fire Engines, for draining Tin and Copper Mines, in the County of Cornwal; and for appropriating the Supplies granted in this Session of Parliament; and for making forth Duplicates of Exchequer Bills, Lottery Tickets, and Orders, lost, burnt, or otherwise destroyed; and for the giving further Time for the Payment of Duties omitted to be paid for the Indentures and Contracts of Clerks and Apprentices." Hodie 3a vice lecta est Billa, intituled, "An Act to enable Thomas Smith Esquire, Lord of the Manor of Farlington, in the County of Southampton, to supply the Town of Portsmouth and Parts adjacent with good and wholesome Water, at his own proper Costs and Charges." To carry down the said Bill; and acquaint them, that the Lords have agreed to the same, with several Amendments, whereunto their Lordships desire their Concurrence. To return the above mentioned Bill; and to acquaint this House, that they have agreed to their Lordships Amendments made thereto. His Majesty, being seated on the Throne, adorned with His Crown and Regal Ornaments, and attended with His Officers of State; the Prince of Wales, in his Robes, sitting in his Place, on His Majesty's Right Hand; the Lords being also in their Robes; commanded the Gentleman Usher of the Black Rod to let the Commons know, "It is His Majesty's Pleasure, that they attend Him immediately, in this House." "1. An Act for granting to His Majesty the Sum of One Million, out of the Sinking Fund; and for applying other Sums therein mentioned for the Service of the Year One Thousand Seven Hundred and Fortyone; and for allowing a Drawback of the Duties upon Coals used in Fire Engines, for draining Tin and Copper Mines, in the County of Cornwal; and for appropriating the Supplies granted in this Session of Parliament; and for making forth Duplicates of Exchequer Bills, Lottery Tickets, and Orders, lost, burnt, or otherwise destroyed; and for the giving further Time for the Payment of Duties omitted to be paid for the Indentures and Contracts of Clerks and Apprentices." "2. An Act for the Encouragement and Increase of Seamen, and for the better and speedier Manning His Majesty's Fleet." "3. An Act for opening a Trade to and from Persia, through Russia." "4. An Act for the Preservation of the Public Roads, in that Part of Great Britain called England." "5. An Act for surveying the Chief Ports and Head Lands, on the Coasts of Great Britain and Ireland, and the Islands and Plantations thereto belonging, in order to the more exact Determination of the Longitude and Latitude thereof." "6. An Act for restraining and preventing several unwarrantable Schemes and Undertakings, in His Majesty's Colonies and Plantations in America." "7. 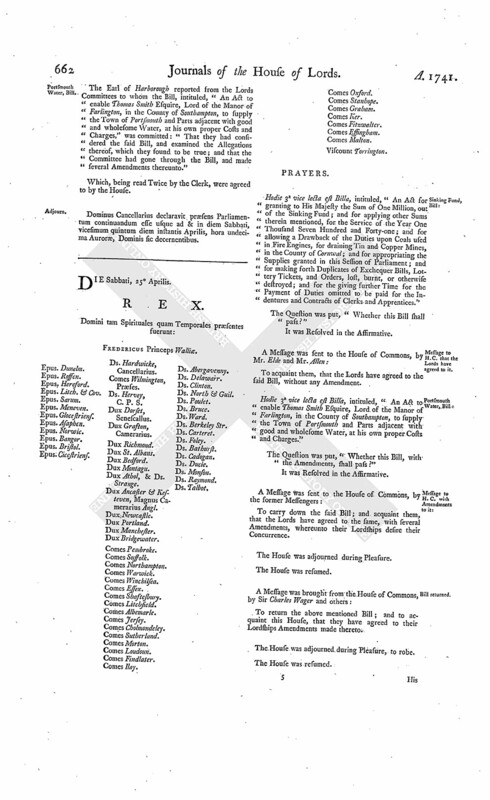 An Act to enable the Commissioners for building a Bridge cross the River Thames, from the City of Westminster, to the opposite Shore in the County of Surrey, to raise a further Sum of Money, towards finishing the said Bridge, and to perform the other Trusts reposed in them; and for exchanging of Tickets unclaimed in the Westminster Bridge Lottery of the Twelfth Year of His present Majesty's Reign; and for making Provision for Tickets in the said Lottery, lost, burnt, or otherwise destroyed." "8. 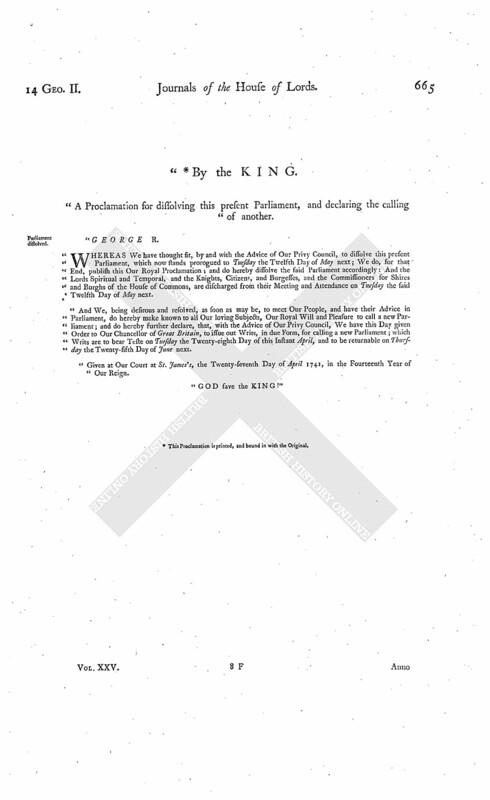 An Act to enable Thomas Smith Esquire, Lord of the Manor of Farlington, in the County of Southampton, to supply the Town of Portsmouth and Parts adjacent with good and wholesome Water, at his own proper Costs and Charges." "9. An Act for empowering Gwyn Vaughan Esquire and his Wife, and their Sons, to make Leases of the Manor of Kingston Seymour, in the County of Somerset, for Lives, or Years determinable on Deaths, according to the Custom of the Country." "10. An Act for naturalizing Francis D'Abbadie." "The Zeal and Dispatch with which you have gone through the Public Business, during the Course of this Session, are undeniable Proofs of your steady Regard to the Welfare of your Country, and consequently the most acceptable Testimonies of your Duty and Affection to Me. The powerful Assistance which you have given Me, for carrying on the just and necessary War in which I am engaged, is the best Means of reducing our Enemies to Reason; and the Vigour and Earnestness which you have so seasonably shewn, for the Defence of the House of Austria, and the Maintenance of the Balance and Liberties of Europe, must give the greatest Encouragement to our Friends. These are the Methods to secure to this Nation that Weight and Influence Abroad, which its natural Strength and Situation entitle it to. "It is with particular Satisfaction I acknowledge your Readiness and Application, in raising the Supplies for the Service of the current Year; which you have done with so just a Regard to the present Exigencies of the Public, as shews you to be the true Representatives of My faithful Commons. "I cannot part with this Parliament, without publicly returning you My Thanks, for the many eminent Instances you have given Me of your Fidelity and Affection to My Person and Government, your fixed Resolution to maintain the Protestant Succession in My Family, and your unshaken Adherence to the true Interest of your Country. You have, with the most becoming Spirit and Firmness, exerted yourselves in vindicating and defending the Honour of My Crown, and the undoubted Rights of Navigation and Commerce belonging to My Subjects; and enabled Me to revenge those Wrongs and Insults, which, contrary to the Faith of Treaties, had been committed against both. In so critical a Conjuncture, you have supported the National Credit, and strengthened the Hands of My Government, to a Degree exceeding the Expectations of those who wished well to us, and to the manifest Disappointment of such as envied our Prosperity. At the same Time, you have demonstrated to all the World, that Great Britain is in a Condition, not only (fn. 1) to desend herself, but also to afford a due Support to her Allies, and the common Cause of Europe. As such a Conduct must give a lasting Reputation to this Parliament; so it will be the Subject of Emulation to those which shall come after it. "I will immediately give the necessary Orders for calling a new Parliament. There is not any Thing I set so high a Value upon, as the Love and Affection of My People; in which I have so entire a Considence, that it is with great Satisfaction I see this Opportunity put into their Hands, of giving Me fresh Proofs of it, in the Choice of their Representatives. "On the present Establishment depends the Continuance of our excellent Constitution in Church and State; and in this Constitution consists the Security of the present Establishment. Nothing can hurt the one, that will not, in Proportion, undermine and weaken the other. For My Part, the uniform Preservation of both, and the Maintenance of the Religious and Civil Rights of all My Subjects, have been, and ever shall be, My constant Care. Those who distinguish themselves by persevering in these Principles shall always find My Countenance and Favour; and, by invariably pursuing these wise and honest Measures, we may entertain the best grounded Hopes, that, under the Protection of the Divine Providence, the Happiness of Great Britain will be perpetuated to Posterity." "It is His Majesty's Royal Will and Pleasure, That this Parliament be prorogued to Tuesday the 12th Day of May next, to be then here held: And this Parliament is accordingly prorogued to Tuesday the 12th Day of May next." " (fn. 2) By the KING. "A Proclamation for dissolving this present Parliament, and declaring the calling of another. 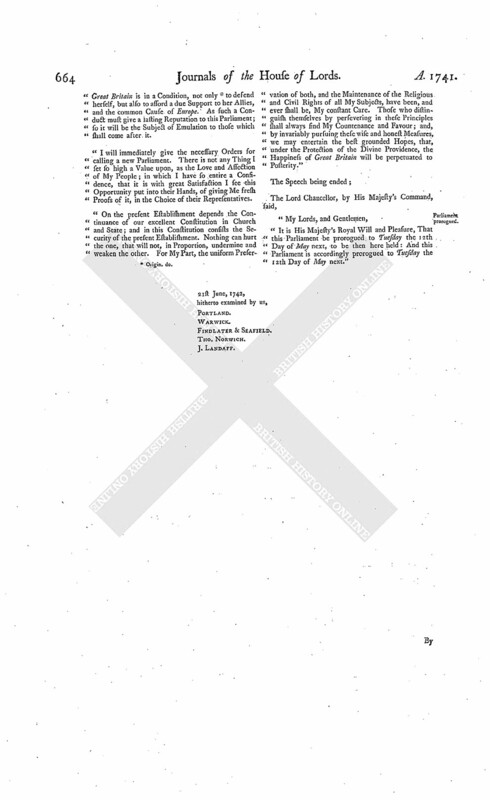 "WHEREAS We have thought fit, by and with the Advice of Our Privy Council, to dissolve this present Parliament, which now stands prorogued to Tuesday the Twelfth Day of May next; We do, for that End, publish this Our Royal Proclamation; and do hereby dissolve the said Parliament accordingly: And the Lords Spiritual and Temporal, and the Knights, Citizens, and Burgesses, and the Commissioners for Shires and Burghs of the House of Commons, are discharged from their Meeting and Attendance on Tuesday the said Twelfth Day of May next. "And We, being desirous and resolved, as soon as may be, to meet Our People, and have their Advice in Parliament, do hereby make known to all Our loving Subjects, Our Royal Will and Pleasure to call a new Parliament; and do hereby further declare, that, with the Advice of Our Privy Council, We have this Day given Order to Our Chancellor of Great Britain, to issue out Writs, in due Form, for calling a new Parliament; which Writs are to bear Teste on Tuesday the Twenty-eighth Day of this Instant April, and to be returnable on Thursday the Twenty-fifth Day of June next. "Given at Our Court at St. James's, the Twenty-seventh Day of April 1741, in the Fourteenth Year of Our Reign. 2. This Proclamation is printed, and bound in with the Original.